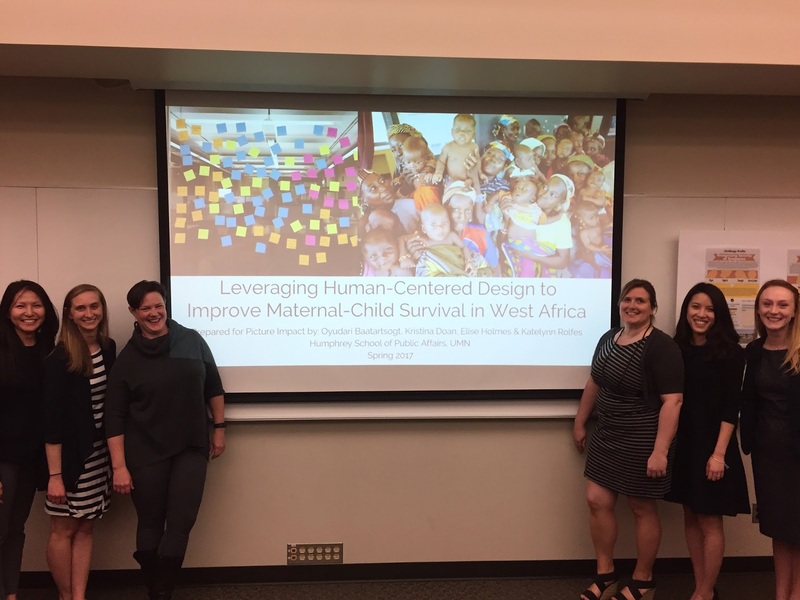 Humphrey School of Public Affairs graduate students Oyudari Baatartsogt (MDP '17), Kristina Doan (MPP ’17), Elise Holmes (MPP ’17), and Katelynn Sobraske (MDP ’17) presented their final capstone research project on the topic of leveraging human-centered design to improve Maternal-Child survival (MCS) in West Africa. Their project is the first step of a multi-year, multi-step project in collaboration with human-centered social design studio, Picture Impact, based in Minneapolis, MN. Their report provided a landscape analysis and identification of primary design challenges pertaining to the improvement of Maternal-Child Survival in West Africa. The project is framed in the model of human-centered design thinking (HCD), a methodology that is human-focused and occurs in four phases: discover, define, design and deliver. The team conducted a desk review of the MCS landscape, did interviews with relative experts, and developed user profiles to center information in a human perspective. The project resulted in the identification of three primary design challenges that are barriers to improving maternal-child survival in West Africa which include key players such as fathers, traditional birth attendants, and modern medical providers. These three challenges will be tested and evaluated in the field in the next phase of the project. The capstone team believes the challenges identified align well with the actual challenges that exist in maternal and child health in West Africa and that attentiveness to them will truly improve maternal and child survival.